Sometimes it’s instructive to go back to where a tradition comes from so as to really appreciate just how innovative recent developments are. Santiago Lara did that to great effect on the middle Saturday of the 2018 Festival de Jerez, with the guitar. A friend and I did so as spectators, accidentally, on the following Monday and Tuesday. First we saw the Gala de Ganadores (winners) of the Turin International Flamenco Competition strut their stuff in the Sala Compania. The first thing we noticed were the young people, both in the audience and warming up in the corridors and on the stage. This was going to be a concert for and given by youngsters (although it transpired that the more senior winners were in their twenties). The standard was very high, though the Gala did have something of a superior school concert about it, as each prize-winner performed their piece. There were Italians, Spanish, Japanese and Germans (even one Brit) and all were applauded warmly. The corps de ballet was well drilled and skilful, though the stage of the Compania was really too small for them. Some future stars there perhaps. Though I confess that, after two hours, my heart sank at the presentation of yet another buleria from yet another smiling prize-winner, however proficient. Yet this is where everyone begins, with the traditional steps and the traditional costumes. How they develop might take them somewhere else entirely. 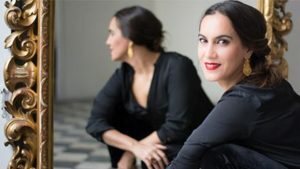 Take Rafaela Carrasco, for example, the prize-winning dancer and, for the last five years, dancer and Director at the Ballet Flamenco de Andalucia. 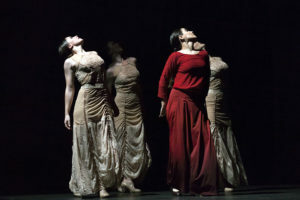 Carrasco has performed widely in Europe, including at Sadlers Wells in London where her latest show was presented in February. We first saw her, solo, in a rain-interrupted but impressive tribute to Lola Flores at the 2017 Festival in Bodega Gonzales Byass. On Tuesday at Teatro Villamarta she presented Nacida Sombra, or Born a Shadow, a stage show based on the life and works of four highly influential Spanish women of the Age of Gold, as part of the Mujeres en Nombre Proprio cycle. This clearly came from the flamenco tradition, but it was also a fusion of ballet, modern dance and drama. 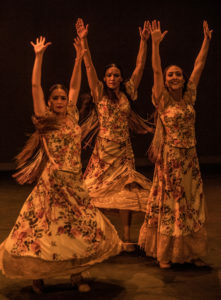 Danced by four female dancers, Carrasco leading, it used jazz and baroque music as well as flamenco, the latter composed by the musicians and singers who appeared on stage to deliver it. Its words came from the writings and poetry of the female subjects. The choreography was Carrasco’s and the story by dramatist Alvaro Tato. From the opening, when the audience heard an irregular drumming sound from behind the stage curtains, revealed to be Carrasco dancing unaccompanied as the curtains opened, it was entrancing. Carrasco portrayed Teresa de Jesus, 16th century author and saint, her three colleagues, Florencia O’Ryan, Carmen Angulo and Paula Comitre – remarkable dancers in their own right – enacted Maria de Zayas, 17th century proto-feminist novelist, Maria Corazon, 17th century actress and writer (and lover of King Felipe IV) and Juana de la Cruz, 17th century writer and poet of ‘New Spain’. Carrasco/Teresa it is who opens the box containing the ‘writings’ of each of the women. The dancers were differently clad and, save for Carrasco who wore dramatic red throughout, all four dancers ‘became’ each woman, by changing costumes. So we saw a dramatic modern jazz section, portraying Zayas, a very joyous section for Corazon and the baroque garden section for de la Cruz. After a ‘dark night of the soul’ the set returns to Carrasco/Teresa. The dancing was truly astounding, the fluidity of motion, angularity and grace made one gape in amazement. I didn’t know much about the subjects, except Saint Teresa of Avila and I had just about heard of Maria Corazon, but this did not diminish my enjoyment. Nor that of the audience in a packed theatre. At the end there was just a moment of absolute silence as the last stage picture faded to dark. Then applause rang around the auditorium and people got to their feet. The ovation lasted for many minutes as the performers came to the front of the stage and the customary rhythmic stamping of approbation began. Superb artistry and somewhere far removed from the polka-dotted dresses and silky fringed shawls of the Gala Ganadores, but still flamenco. Rafaela Carrasco (‘Nacida sombra’)-XXII Festival de Jerez from Festival de Jerez Televisión on Vimeo. This entry was posted in Culture Vulture, Festival de Jerez and tagged Festival de Jerez by juliej. Bookmark the permalink.